We are offering our clients Djembe Drums made of good quality wood. Sizes available are 8 inch Diameter to 18 inch Diameter. We are majorly looking for foreign queries. 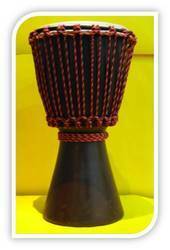 Mostly customers preferred to purchase quality products, so we are involved in providing Djembe Drum. 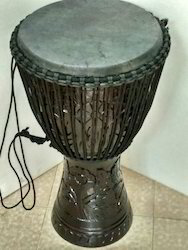 Tom Size: 6", 8", 10"
As per the necessities of the patrons, we are involved in providing the optimum quality series of Wooden Body Djembe Drum. We are providing this product at low prices. Save money and time with self tunable model to adjust sound to desired tones without visiting tuner. 12" wooden djembe with yellow and rastafarian rope work. Shell made from high quality mango wood and head made from quality skin for amazing sound. Also available in 8", 10" and 14" size.